According to several, peer-reviewed scientific studies, the solution may lie in the humble red beet (Beta vulgaris). Athletes who consume red beet juice, a rich source of naturally occurring antioxidants and nitrates, consistently find benefits in trial performance in a number of activities ranging from bicycling to knee-extensor exercises. The key to the greater stamina reported likely involves the ability of beet juice to improve circulation and increase peripheral tissue oxygenation. What’s more, beet root juice also supports cardiovascular health by reducing blood pressure, irregular blood clotting and, possibly, high triglycerides as well. 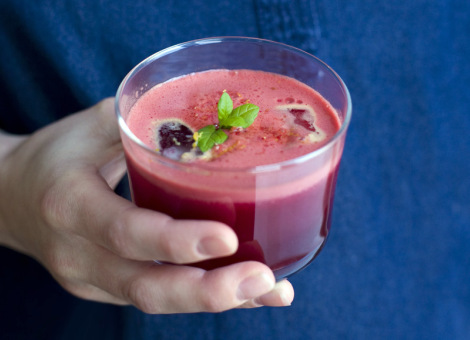 If there is a down side to drinking red beet juice, it would be its high sugar content. The best way to derive the benefits of beet juice while limiting sugar intake is to supplement with beet root juice extracts or powders. For instance, one the most popular products on the market yields only 5 grams of sugar per concentrated tablespoon of beet juice powder. Finally, if you decide to try beet root juice and you find a distinct reddening when you use the bathroom, don’t worry. This is a well known reaction known as beeturia which affects approximately 14% of the population. Great article and some good research sources there my friend. Nice and simple for folks to understand. I use juicing therapeutically in my practice often and many people are amazed at how quickly their well being turns around from poor to great for them! Awesome stuff! Thank you for sharing your experience and success with us, Craig. In general, I recommend whole foods or even blended whole foods over juicing. But, the research supporting the benefits of red beet juice seem quite solid to me. Perhaps future inquiries will clarify whether similar or better results can be expected from the use of low-sugar versions of the actual juice (extracts, powders). In general,foods that are purple or cyanic will improve vascular endothelial call production of nitric oxide. These cells and other epithelial cells get damaged by fungal overgrowth and the subsequent process of inflammation. The cynanic color in produce is due to phenolics,anthocyanidins and other antifungals plant make to protect themselves. Cranberry and pomegranite will have the same effect. These not only lower blood pressure,by increasing vascular endothelial cell production of nitric oxide,erectile function is also improved. Indeed,erectile dysfunction is many times an early indicator of vascular disease that later manifest as coronary or carotid artery disease. I agree that richly pigmented fruits and vegetables tend to benefit endothelial function and health. However, it appears that red beets impart added support due to their naturally occurring nitrate content. I’m also a big fan of cranberries and pomegranate extracts. I certainly think they’re health promoting for the cardiovascular system and beyond. Excellent foods and supplements. JP, what’s the difference between Nitrites in beets and nitrites in hot dogs. Why is one good for you and one bad for you. Thank you for any light you may be able to shed on this. Beets and various vegetables (green leafy veggies in particular) contain naturally occurring nitrates – which appear to enhance circulation, physical performance, etc. Isolated sodium nitrate is included in some processed foods to maintain product integrity. Hot dogs contain a chemically-related, synthetic preservative called sodium nitrite – a suspected carcinogen. Most refined foods with added nitrites (spelled with an ‘i’) *may* have harmful effects. On the other hand, vegetables that contain nitrates (spelled with an ‘a’) tend to possess a multitude of anti-cancer components (carotenoids, fiber, phytochemicals, etc.). My advice: 1) Don’t worry about vegetables that are rich in nitrates. In fact, these may be worth seeking out under certain circumstances. 2) Avoid processed foods that contain sodium nitrate and nitrite. Yes, I am into the vegetables, not the hot dogs. Thanks so much. Conclusions: Based on the available data, beetroot appears to be a powerful dietary source of health promoting agents that holds potential as therapeutic treatment for several pathological disorders. The powerful antioxidant, anti-inflammatory and vascular-protective effects offered by beetroot and its constituents have been clearly demonstrated by several in vitro and in vivo human and animal studies; hence its increasing popularity as a nutritional approach to help manage cardiovascular disease and cancer. In the human studies to date, beetroot supplementation has been reported to reduce blood pressure, attenuate inflammation, avert oxidative stress, preserve endothelial function and restore cerebrovascular haemodynamics. Furthermore, although beyond the scope of this review, several studies have now established beetroot supplementation as an effective means of enhancing athletic performance. Dietary nitrate provides sustained blood pressure lowering in hypertensive patients: a randomized, phase 2, double-blind, placebo-controlled study. Single dose administration of dietary inorganic nitrate acutely reduces blood pressure (BP) in normotensive healthy volunteers, via bioconversion to the vasodilator nitric oxide. We assessed whether dietary nitrate might provide sustained BP lowering in patients with hypertension. We randomly assigned 68 patients with hypertension in a double-blind, placebo-controlled clinical trial to receive daily dietary supplementation for 4 weeks with either dietary nitrate (250 mL daily, as beetroot juice) or a placebo (250 mL daily, as nitrate-free beetroot juice) after a 2-week run-in period and followed by a 2-week washout. We performed stratified randomization of drug-naive (n=34) and treated (n=34) patients with hypertension aged 18 to 85 years. The primary end point was change in clinic, ambulatory, and home BP compared with placebo. Daily supplementation with dietary nitrate was associated with reduction in BP measured by 3 different methods. Mean (95% confidence interval) reduction in clinic BP was 7.7/2.4 mm Hg (3.6-11.8/0.0-4.9, P<0.001 and P=0.050). Twenty-four-hour ambulatory BP was reduced by 7.7/5.2 mm Hg (4.1-11.2/2.7-7.7, P<0.001 for both). Home BP was reduced by 8.1/3.8 mm Hg (3.8-12.4/0.7-6.9, P<0.001 and P<0.01) with no evidence of tachyphylaxis over the 4-week intervention period. Endothelial function improved by ≈20% (P<0.001), and arterial stiffness was reduced by 0.59 m/s (0.24-0.93; P<0.01) after dietary nitrate consumption with no change after placebo. The intervention was well tolerated. This is the first evidence of durable BP reduction with dietary nitrate supplementation in a relevant patient group. These findings suggest a role for dietary nitrate as an affordable, readily-available, adjunctive treatment in the management of patients with hypertension (funded by The British Heart Foundation). J Nutr Sci. 2014 Apr 30;3:e9. Produce rich in phytochemicals may alter postprandial glucose and insulin responses by interacting with the pathways that regulate glucose uptake and insulin secretion in humans. The aims of the present study were to assess the phytochemical constituents of red beetroot juice and to measure the postprandial glucose and insulin responses elicited by either 225 ml beetroot juice (BEET), a control beverage matched for macronutrient content (MCON) or a glucose beverage in healthy adults. Beetroot juice was a particularly rich source of betalain degradation compounds. The orange/yellow pigment neobetanin was measured in particularly high quantities (providing 1·3 g in the 225 ml). A total of sixteen healthy individuals were recruited, and consumed the test meals in a controlled single-blind cross-over design. Results revealed a significant lowering of the postprandial insulin response in the early phase (0-60 min) (P < 0·05) and a significantly lower glucose response in the 0-30 min phase (P < 0·05) in the BEET treatment compared with MCON. Betalains, polyphenols and dietary nitrate found in the beetroot juice may each contribute to the observed differences in the postprandial insulin concentration. Nitric Oxide. 2015 Aug 29. 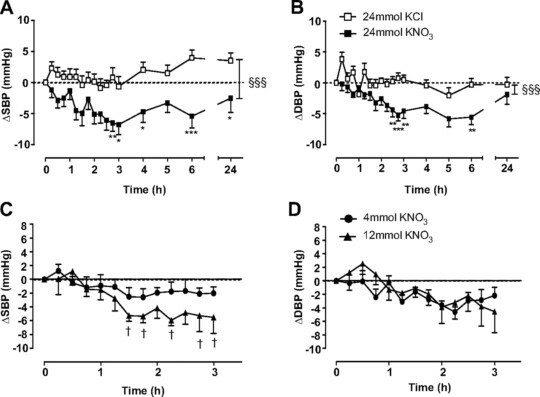 Acute dietary nitrate supplementation improves arterial endothelial function at high altitude: A double-blinded randomized controlled cross over study. INTRODUCTION: Dietary nitrate (NO3-) supplementation serves as an exogenous source of nitrite (NO2-) and nitric oxide (NO) through the NO3- – NO2- – NO pathway, and may improve vascular functions during normoxia. The effects of NO3- supplementation in healthy lowlanders during hypobaric hypoxia are unknown. PURPOSE: Determine the effect of acute oral NO3-supplementation via beetroot juice (BJ) on endothelial function (flow mediated dilation; FMD) in lowlanders at 3700m. METHODS: FMD was measured using ultrasound and Doppler in the brachial artery of 11 healthy subjects (4 females, age 25±5 yrs; height 1.8±0.1m, weight 72±10 kg) sojourning to high altitude. In a randomized, double-blinded crossover study design, FMD was measured 3 hours after drinking BJ (5.0 mmol NO3-) and placebo (PL; 0.003 mmol NO3-) supplementation at 3700m, with a 24-hour wash out period between tests. FMD was also measured without any BJ supplementation pre-trek at 1370m, after 5 days at 4200m and upon return to 1370m after 4 weeks of altitude exposure (above 2500 m). The altitude exposure was interrupted by a decent to lower altitude where subjects spent two nights at 1370m before returning to altitude again. RESULTS: Ten subjects completed the NO3- supplementation. FMD (mean±SD) pre-trek value was 6.53±2.32% at 1370m. At 3700m FMD was reduced to 3.84±1.31% (p<0.01) after PL supplementation but was normalized after receiving BJ (5.77±1.14% (p=1.00). Eight of the subjects completed the interrupted 4-week altitude stay, and their FMD was lower at 4200m (FMD 3.04±2.22%) and at post-altitude exposure to 1370m (FMD 3.91±2.58%) compared to pre-trek FMD at 1370m. CONCLUSION: Acute dietary NO3-supplementation may abolish altitude-induced reduction in endothelial function, and can serve as a dietary strategy to ensure peripheral vascular function in lowland subjects entering high altitude environments. Circ Heart Fail. 2015 Jul 15. Acute Dietary Nitrate Intake Improves Muscle Contractile Function in Patients with Heart Failure: A Double-Blind, Placebo-Controlled, Randomized Trial. BACKGROUND: Skeletal muscle strength, velocity, and power are markedly reduced in heart failure (HF) patients, which contributes to their impaired exercise capacity and lower quality of life. This muscle dysfunction may be partially due to decreased nitric oxide (NO) bioavailability. We therefore sought to determine whether ingestion of inorganic nitrate (NO3 -) would increase NO production and improve muscle function in patients with HF due to systolic dysfunction. METHODS AND RESULTS: Using a double-blind, placebo-controlled, randomized crossover design, we determined the effects of dietary NO3 – in nine HF patients. After fasting overnight, subjects drank beetroot juice containing or devoid of 11.2 mmol NO3 -. Two hours later, muscle function was assessed using isokinetic dynamometry. Dietary NO3 – increased (P<0.05-0.001) breath NO by 35-50%. This was accompanied by 9% (P=0.07) and 11% (P<0.05) increases in peak knee extensor power at the two highest movement velocities tested (i.e., 4.71 and 6.28 rad/s). Maximal power (calculated by fitting peak power data with a parabola) was therefore greater (i.e., 4.74±0.41 vs. 4.20±0.33 W/kg; P<0.05) after dietary NO3 – intake. Calculated maximal velocity of knee extension was also higher following NO3 – ingestion (i.e., 12.48±0.95 vs. 11.11±0.53 rad/s; P<0.05). Blood pressure was unchanged, and no adverse clinical events occurred. CONCLUSIONS: In this pilot study, acute dietary NO3 – intake was well-tolerated and enhanced NO bioavailability and muscle power in patients with systolic HF. Larger-scale studies should be conducted to determine whether the latter translates into an improved quality of life in this population. Am J Clin Nutr. 2016 Jan;103(1):25-38. Dietary nitrate improves vascular function in patients with hypercholesterolemia: a randomized, double-blind, placebo-controlled study. BACKGROUND: The beneficial cardiovascular effects of vegetables may be underpinned by their high inorganic nitrate content. OBJECTIVE: We sought to examine the effects of a 6-wk once-daily intake of dietary nitrate (nitrate-rich beetroot juice) compared with placebo intake (nitrate-depleted beetroot juice) on vascular and platelet function in untreated hypercholesterolemics. DESIGN: A total of 69 subjects were recruited in this randomized, double-blind, placebo-controlled parallel study. The primary endpoint was the change in vascular function determined with the use of ultrasound flow-mediated dilatation (FMD). RESULTS: Baseline characteristics were similar between the groups, with primary outcome data available for 67 patients. Dietary nitrate resulted in an absolute increase in the FMD response of 1.1% (an ∼24% improvement from baseline) with a worsening of 0.3% in the placebo group (P < 0.001). A small improvement in the aortic pulse wave velocity (i.e., a decrease of 0.22 m/s; 95% CI: -0.4, -0.3 m/s) was evident in the nitrate group, showing a trend (P = 0.06) to improvement in comparison with the placebo group. Dietary nitrate also caused a small but significant reduction (7.6%) in platelet-monocyte aggregates compared with an increase of 10.1% in the placebo group (P = 0.004), with statistically significant reductions in stimulated (ex vivo) P-selectin expression compared with the placebo group (P < 0.05) but no significant changes in unstimulated expression. No adverse effects of dietary nitrate were detected. The composition of the salivary microbiome was altered after the nitrate treatment but not after the placebo treatment (P < 0.01). The proportions of 78 bacterial taxa were different after the nitrate treatment; of those taxa present, 2 taxa were responsible for >1% of this change, with the proportions of Rothia mucilaginosa trending to increase and Neisseria flavescens (P < 0.01) increased after nitrate treatment relative to after placebo treatment. CONCLUSIONS: Sustained dietary nitrate ingestion improves vascular function in hypercholesterolemic patients. These changes are associated with alterations in the oral microbiome and, in particular, nitrate-reducing genera. Our findings provide additional support for the assessment of the potential of dietary nitrate as a preventative strategy against atherogenesis in larger cohorts. It has been reported that nitrate supplementation can improve exercise performance. Most of the studies have used either beetroot juice or sodium nitrate as a supplement; there is lack of data on the potential ergogenic benefits of an increased dietary nitrate intake from a diet based on fruits and vegetables. Our aim was to assess whether a high-nitrate diet increases nitric oxide bioavailability and to evaluate the effects of this nutritional intervention on exercise performance. Seven healthy male subjects participated in a randomized cross-over study. They were tested before and after 6 days of a high (HND) or control (CD) nitrate diet (~8.2 mmol∙day−1 or ~2.9 mmol∙day−1, respectively). Plasma nitrate and nitrite concentrations were significantly higher in HND (127 ± 64 µM and 350 ± 120 nM, respectively) compared to CD (23 ± 10 µM and 240 ± 100 nM, respectively). In HND (vs. CD) were observed: (a) a significant reduction of oxygen consumption during moderate-intensity constant work-rate cycling exercise (1.178 ± 0.141 vs. 1.269 ± 0.136 L·min−1); (b) a significantly higher total muscle work during fatiguing, intermittent sub-maximal isometric knee extension (357.3 ± 176.1 vs. 253.6 ± 149.0 Nm·s·kg−1); (c) an improved performance in Repeated Sprint Ability test. These findings suggest that a high-nitrate diet could be a feasible and effective strategy to improve exercise performance. J Hum Hypertens. 2016 Oct;30(10):627-32. Improvement of hypertension, endothelial function and systemic inflammation following short-term supplementation with red beet (Beta vulgaris L.) juice: a randomized crossover pilot study. Hypertension is a major risk factor for cardiovascular disease and has a prevalence of about one billion people worldwide. It has been shown that adherence to a diet rich in fruits and vegetables helps in decreasing blood pressure (BP). This study aimed to investigate the effect of raw beet juice (RBJ) and cooked beet (CB) on BP of hypertensive subjects. In this randomized crossover study, 24 hypertensive subjects aged 25-68 years old were divided into two groups. One group took RBJ for 2 weeks and the other group took CB. After 2 weeks of treatment, both groups had a washout for 2 weeks then switched to the alternate treatment. Each participant consumed 250 ml day(-1) of RBJ or 250 g day(-1) of CB each for a period of 2 weeks. Body weight, BP, flow-mediated dilation (FMD), lipid profile and inflammatory parameters were measured at baseline and after each period. According to the results, high-sensitivity C-reactive protein (hs-CRP) and tumour necrosis factor alpha (TNF-α) were significantly lower and FMD was significantly higher after treatment with RBJ compared with CB (P<0.05). FMD was significantly (P<0.05) increased, but systolic and diastolic BP, intracellular adhesion molecule-1 (ICAM-1), vascular endothelial adhesion molecule-1 (VCAM-1), hs-CRP, interleukin-6, E-selectin and TNF-α were significantly (P<0.05) decreased with RBJ or CB. Total antioxidant capacity was increased and non-high-density lipoprotein (HDL), low-density lipoprotein (LDL) and total cholesterol (TC) were decreased with RBJ but not with CB. Although both forms of beetroot were effective in improving BP, endothelial function and systemic inflammation, the raw beetroot juice had greater antihypertensive effects. Also more improvement was observed in endothelial function and systemic inflammation with RBJ compared with CB. It has been shown that nitrate supplementation can enhance endurance exercise performance. Recent work suggests that nitrate ingestion can also increase intermittent type exercise performance in recreational athletes. We hypothesized that six days of nitrate supplementation can improve high-intensity intermittent type exercise performance in trained soccer players. Thirty-two male soccer players (age: 23 ± 1 years, height: 181 ± 1 m, weight: 77 ± 1 kg, playing experience: 15.2 ± 0.5 years, playing in the first team of a 2nd or 3rd Dutch amateur league club) participated in this randomized, double-blind cross-over study. All subjects participated in two test days in which high-intensity intermittent running performance was assessed using the Yo-Yo IR1 test. Subjects ingested nitrate-rich (140 mL; ~800 mg nitrate/day; BR) or a nitrate-depleted beetroot juice (PLA) for six subsequent days, with at least eight days of wash-out between trials. The distance covered during the Yo-Yo IR1 was the primary outcome measure, while heart rate (HR) was measured continuously throughout the test, and a single blood and saliva sample were collected just prior to the test. Six days of BR ingestion increased plasma and salivary nitrate and nitrite concentrations in comparison to PLA (p < 0.001), and enhanced Yo-Yo IR1 test performance by 3.4 ± 1.3% (from 1574 ± 47 to 1623 ± 48 m; p = 0.027). Mean HR was lower in the BR (172 ± 2) vs. PLA trial (175 ± 2; p = 0.014). Six days of BR ingestion effectively improves high-intensity intermittent type exercise performance in trained soccer players. Int J Food Sci Nutr. 2018 Sep 6:1-10. Dietary nitrate improved exercise capacity in COPD but not blood pressure or pulmonary function: a 2 week, double-blind randomised, placebo-controlled crossover trial. Dietary nitrate may improve exercise tolerance in some healthy and clinical populations. Existing data regarding dietary nitrate in COPD is inconsistent. We conducted a 14d double-blind, randomised, placebo-controlled, crossover trial of daily nitrate-rich beetroot juice (BRJ; 12.9 mmol) versus nitrate-depleted BRJ (PL; 0.5 mmol). At baseline and after each condition, we assessed functional capacity (incremental shuttle walk test; ISWT), ambulatory blood pressure, pulmonary function, quality of life as well as exhaled nitric oxide (eNO), and plasma nitrate/nitrite (NOx). Eight subjects with COPD completed the trial. BRJ supplementation was associated with significantly increased NOx (p < .05) and a 14.6% increase in ISWT distance (+56 m, p = .00004) as well as a trend towards increased eNO compared to PL. There was no other differences. Dietary nitrate appears to have ergogenic effect in subjects with mild-moderate COPD. This effect does not appear to be related to altering blood pressure or pulmonary function. Dietary Nitrate from Beetroot Juice for Hypertension: A Systematic Review. According to current therapeutic approaches, a nitrate-dietary supplementation with beetroot juice (BRJ) is postulated as a nutritional strategy that might help to control arterial blood pressure in healthy subjects, pre-hypertensive population, and even patients diagnosed and treated with drugs. In this sense, a systematic review of random clinical trials (RCTs) published from 2008 to 2018 from PubMed/MEDLINE, ScienceDirect, and manual searches was conducted to identify studies examining the relationship between BRJ and blood pressure. The specific inclusion criteria were: (1) RCTs; (2) trials that assessed only the BRJ intake with control group; and (3) trials that reported the effects of this intervention on blood pressure. The search identified 11 studies that met the inclusion criteria. This review was able to demonstrate that BRJ supplementation is a cost-effective strategy that might reduce blood pressure in different populations, probably through the nitrate/nitrite/nitric oxide (NO₃-/NO₂-/NO) pathway and secondary metabolites found in Beta vulgaris. This easily found and cheap dietary intervention could significantly decrease the risk of suffering cardiovascular events and, in doing so, would help to diminish the mortality rate associated to this pathology. Hence, BRJ supplementation should be promoted as a key component of a healthy lifestyle to control blood pressure in healthy and hypertensive individuals. However, several factors related to BRJ intake (e.g., gender, secondary metabolites present in B. vulgaris, etc.) should be studied more deeply.